This is a Licenced Product. We require your pet's details prior to dispatch. Frontline Spray100ml is a solution for controlling and preventing flea and tick infestations in dogs and cats. Frontline Spray - 100ml is a Prescription Only Veterinary Medicine and by law requires a prescription from your vet. In order to purchase this product you need to login or register. The item/s you selected is an authorised veterinary medicine. To complete your order one of our qualified staff must authorise the item is suitable for use. Please select the pet intended for use or create a new one. You don't have any animals associated with your account. Please add a new animal to conitnue. Please clock add a new pet to eneter the details of the animals you wish to use this product on. Frontline Spray is a solution for controlling and preventing flea and tick infestations in dogs and cats. Once applied, Frontline Spray breaks the life cycle of the flea with its persistent adulticide activity, ensuring your pet is not re-infested and your home is kept flea free. When applied as directed by your vet, the active ingredient in Frontline, Fipronil, helps to bring infestations under control. Frontline Spray for cats and dogs can also be used as part of a treatment strategy for flea allergy dermatitis (FAD). Frontline 100ml Spray is manufactured by Merial and developed specifically for cats and dogs. As such, they must never be used in other animals. How much do you charge for Postage and Packaging? Postage and Packaging is FREE on all orders over £25. For orders under £25 we charge a small fee of £1.96. We cannot legally dispatch any orders that contain Prescription Only Veterinary Medicines until we authorise your uploaded prescription or receive the original hard copy prescription via post. Once we have recieved your prescription, we aim to process all orders within 1-2 working days. Most orders are sent by 1st Class Royal Mail, who aim to deliver your goods within 1-2 working days, however, this is NOT guaranteed. Orders containing large items such as pet food or high-value orders will be sent via courier and will require a signature on receipt. We aim to process all online orders NOT containing Prescription Only Veterinary Medicines within 1-2 working days. Small orders will be sent by 1st Class Royal Mail, who aim to deliver your goods within 1-2 working days, however this is NOT guaranteed. Large items including pet food are sent via courier and will require a signature on receipt. PLEASE NOTE FOR ORDERS CONTAINING BOTH PRESCRIPTION AND NON-PRESCRIPTION ITEMS, WE WILL DISPTACH ALL ITEMS ON RECIEPT OF THE ORIGINAL VETERINARY PRESCRIPTION. Help! My order hasn’t arrived! 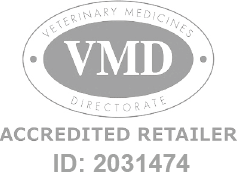 The dedicated veterinary prescription and non-prescription online store. Postal Address: Unit 12, Portal Business Park, Eaton Lane, Tarporley, Cheshire, CW6 9DL, UK. Company Registration Number: 02905946 Site designed & maintained by ITQ Solutions Ltd - Web Design Cheshire.